The CBO says passing an amnesty bill would slash the Obama deficit. 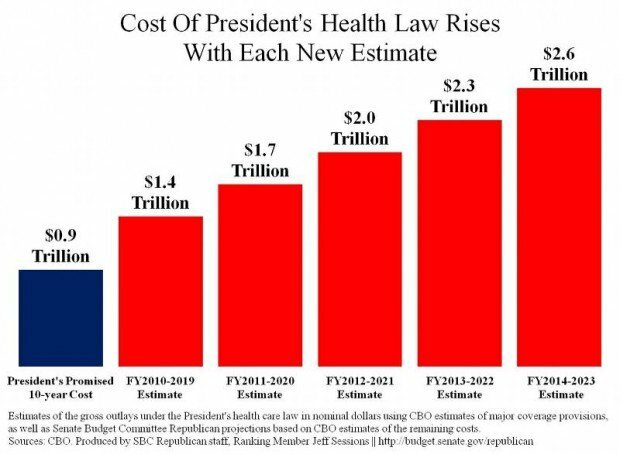 The CBO also told us Obamacare would only cost us a trillion dollars. And, look where that got us. Congressional budget analysts, providing a positive economic assessment of proposed immigration law changes, said Tuesday that legislation to overhaul the nation’s immigration system would cut close to $1 trillion from the federal deficit over the next two decades and lead to more than 10 million new legal residents in the country. A long-awaited analysis by the Congressional Budget Office found that the benefits of an increase in legal residents from immigration legislation currently being debated in the Senate — which includes a pathway to citizenship — would outweigh the costs. While the report was a clear victory for immigration proponents, it came just hours after Speaker John A. Boehner raised potential new obstacles for the bill, saying he would not bring any immigration measure to the floor unless it had the support of a majority of House Republicans. The report estimates that in the first decade after the immigration bill is carried out, the net effect of adding millions of additional taxpayers would decrease the federal budget deficit by $197 billion. Over the next decade, the report found, the deficit reduction would be even greater — an estimated $700 billion, from 2024 to 2033. For the record… Most illegal alien families collect welfare.